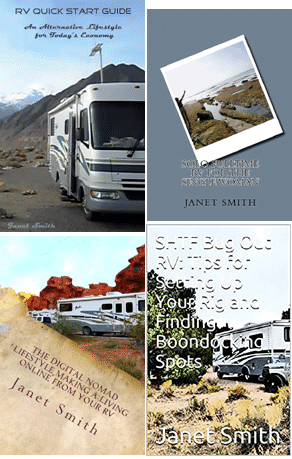 A lot of newbies to the RV lifestyle, especially boondockers wonder, “how do you do laundry when RVing?” The simplest answer is, at a laundromat. Or, check into an RV park every few weeks, to dump and fill your tanks, as well as do laundry. But there are a few options for doing RV laundry while boondocking, with both manual and AC or DC operated mini-washers. While doing laundry onboard your RV while boondocking seems more convenient than going to a laundromat, the thing to consider is water consumption. A small load of laundry can easily take 10 gallons of fresh water; 5 for wash, 5 for rinse. You might consider timing your laundry to your next trip to the dump/fill station. Use up the remainder of your fresh water on laundry, and immediately dump and refill. Also, most of these washers are small, and you may need to take sheets and towels to a laundromat anyways. Drying sheets and towels may also be problematic, without a dryer, or a clothesline. As far as drying clothing, you can hang items to dry from your ladder, in the shower, from your overhead cabinets, etc. I personally have this washer. The upside is, it does not require any electricity, it is hand crank. The downside is, you need to hand wring the wet clothes. Another upside, I can fill this with fresh water, for an extra 5 gallons onboard. Another upside, it is lightweight, only weighs about 5 lbs. It is also easy to take outside. With no moving or electrical parts, this may last forever. This little hand crank washer can do 2 pairs of jeans, or quite a few tee shirts, and lots of underwear. The manufacturer states, “Washing capacity: 7-8 dress shirts/ 10 T-shirts/ 2 pairs of jeans”. It holds about 5 gallons. Get it on Amazon here. This hand spinner could be an addition to the Wonder Washer above, or a stand alone unit. (You need to consider your storage) The design of EcoSpin does not have an agitator. With EcoSpin, your clothes will come out 95% dry, to reduce the time it takes to dry clothes. A downside to the EcoSpinn appears to be it’s size. It only holds around a gallon and a half. You probably won’t be able to do heavier, thicker items, like jeans. 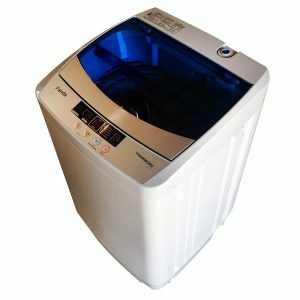 But at just 13 1/2 inches in diameter, and height, this portable washer can be stored away easily. Get it on Amazon. 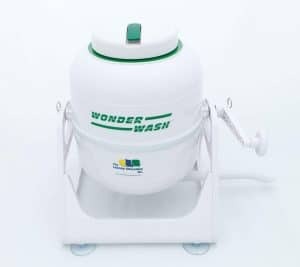 This is a unique little washer, which could be very good for a van, or a small Class C or trailer. It has a small agitator in the bottom, which is USB powered. It also has a timer, so it shuts down automatically after 30 minutes. While it’s compact size it a definite advantage, it can only do small items, like tee shirts and underwear. The HETAO will not be able to handle jeans or heavier items. The collapsible sides and the USB connector/motor may wear out over time. 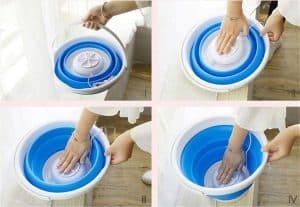 Get this foladable washer on Amazon. This unit runs off AC power. You can run it off solar on an inverter, or with the generator running. 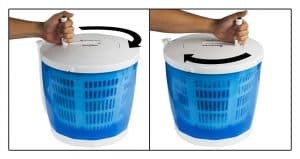 This mini washing machine has two separate tubs, one for washing, and one for spinning. It has several different settings for speed and timing. This mini washer has a washing capacity of 8.8 lbs, and 6.6 lbs rated spin capacity. Reviewers on Amazon report that is holds 5-6 women’s shirts, 3-4 men’s shirts, or 2-3 pairs of jeans. Reviewers also report that it is a little larger than the photo implies. The user reported size is: 22.6″ length, X14.0″ wide X22.2″ high,and weight is about 23.5lbs. It drains via gravity. So make sure you have enough kitchen counter space for this, or plan to use it inside the shower. Get this RV washer on Amazon. This washer seems to be popular with a few You Tube RVers. 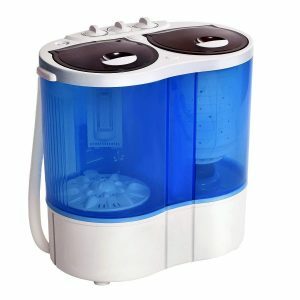 This portable washer is lightweight, and it has a larger capacity, for up to 11 lbs. of clothing. It requires AC power, and it has a 3 prong, 110 Voltage plug. The washer connects directly to a standard faucet using the inlet hose and a quick adapter. It also is designed to drain into the sink, with a J-shaped hose, which will hook over the sink. This may either be an advantage, or a disadvantage; it would tie the washer to the kitchen faucet. Also, it may not be able to run off the RV shower, without some adaptation. The Panda boasts electronic controls, with LED display, and 10 washing programs, and 8 water levels. Stainless steel drum is durable and resists rust and chipping. Get the Panda RV washer on Amazon. In addition to a portable washing machine, you will need a way to dry your laundry. That means doing it the old fashioned way, by hanging it up to dry. You can use a drying rack, or a portable clothesline.